These are the first words you hear on the opening track for Austrian Death Machine’s debut album Total Brutal. 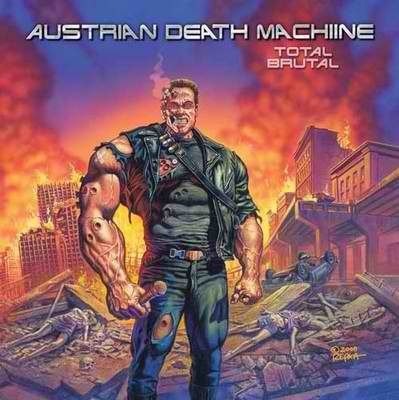 The brain child of As I Lay Dying frontman Tim Lambesis, Austrian Death Machine is both a tribute to and a parody of Arnold Schwarzenegger films. Lambesis both sings and plays all instruments on all the tracks while Chad Ackerman (Count your Curses, Destroy the Runner) provides the voice of “Ahhnold”. With titles like “Get to the Chopper”, “Who is your Daddy and what does he do?” and “If it bleeds, we can kill it.”, every track brings direct reference to the Arnold classics. The heavy sound, clean recording and strong vocal often make you forget that the album isn’t supposed to be taken completely serioisly. If it wasn’t for the interludes between songs with Ahhnold it can be at times just as good as any other metal album out there. If you’re a fan of metal or Arnold Schwarzenegger, Total Brutal is a must have. Whether it makea you head bang or laugh hysterically, the album does not disappoint! Don’t forget the second album “Double Brutal” which features more quotes, as well as a 2nd disc with songs covered based around some of his movies. Couldn’t have said it better myself. This album is a hidden gem. Hey. If you like this band check out ArnoCorps. They were doing this about a decade earlier and doing it better, imho.